« Wishing All Those Dads Out There a Happy Father’s Day! I think every little girl, at one time or another, becomes inspired by fashion and designing their own outfits. I know I did. I still remember the Christmas that I received the toy, "Fashion Plates", whereby you could mix and match different shirts, pants, etc. to create one-of-a-kind, unique outfits. Now, this fashion wardrobe design for little girls has been taken to the next level with Fashion Playtes, a company that actually lets you create your own piece of clothing that they will sew especially for you! Although Riley is too young to participate in this garment creation process just yet, the little girl with the Fashion Plates toy tucked under her arm was aching to give this a try! 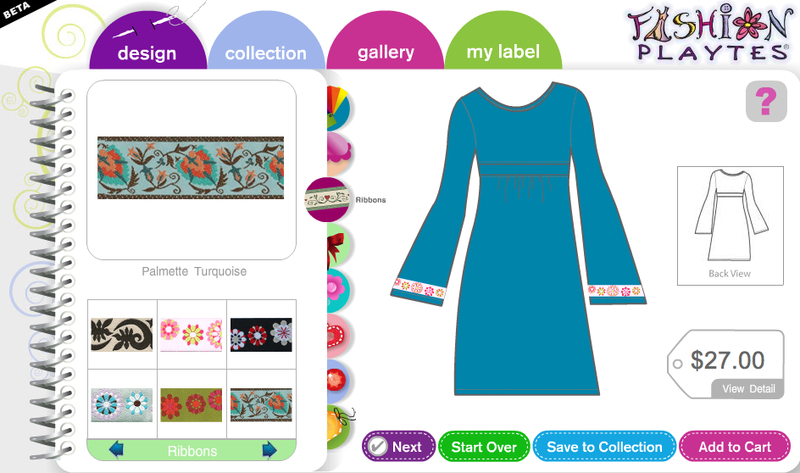 I DESIGNED the Cassidy Empire Long Sleeve Dress from Fashion Playtes, which retails for $20.00, but after adding custom ribbons and a peace sign embroidered applique, my dress cost $41.50. I was very excited to have the opportunity to review the Fashion Playtes experience as well as the finished product I created. I thought that this was a very cool concept to actually create your own article of clothing (girls' sizes 6-14) from the options given to you on the website and couldn't wait to get started. I was surprised at how many different options there were to choose from! Although I spent over 30 minutes designing the dress I ordered, I really liked having so many different options available to me. This ensures that you have a multitude of different combinations and so it's possible for your child to actually create something unique! I decided to design the Cassidy Empire Long Sleeve Dress (shown above). The base price of just the dress was $20.00 and then for every embellishment added, the price went up accordingly. I added ribbon along the empire waistline, as well as around the hem of the dress and around each sleeve cuff too. 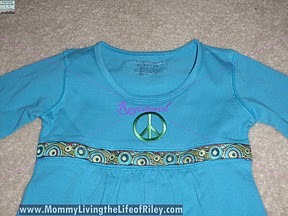 I also added a green embroidered peace sign applique to the front of the dress. My total for adding these items was an additional $21.50, which brought the grand total to $41.50 for my creation. In just a few short weeks, I received my custom dress in the mail. I was thrilled at how cute it looked, but after closer inspection, I was disappointed with a few things. In the very top picture, you can see what the dress as a whole looks like. This is the view that I was thrilled with. I thought that everything matched nicely and that this would make an adorable dress for Riley as soon as she was big enough to wear it. In the second picture on the left, you can see an up-close view of the top of the dress. 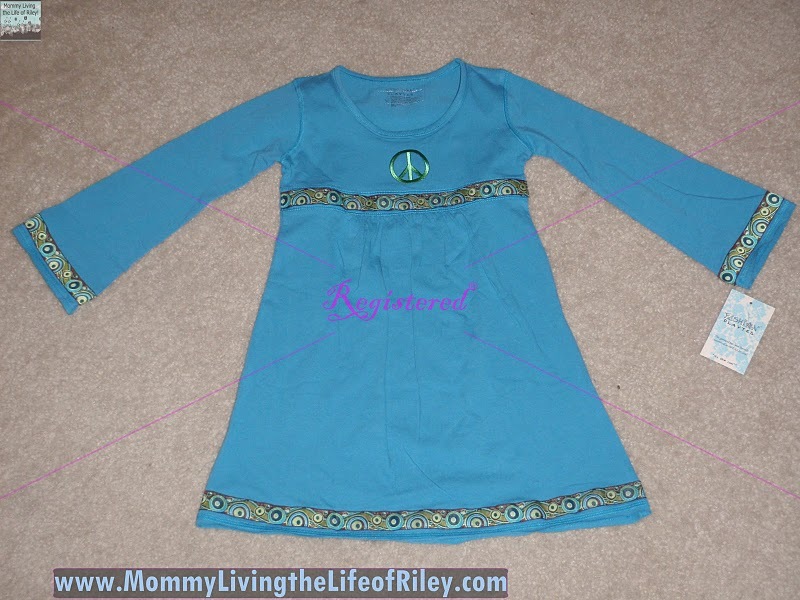 The ribbon is sewn on the dress well and the peace sign applique is flawless. The next three pictures show why I'm not thrilled with this dress any longer. The third picture on the right shows how the dress is really constructed. This dress is made from jersey knit material (just like t-shirts are) and unfortunately, has an unfinished hem around the neckline, the sleeves and the bottom of the dress. Although there is a seam, it is not at the ends of the dress. The very ends of the sleeve, neckline and hem are just raw, trimmed t-shirt material. 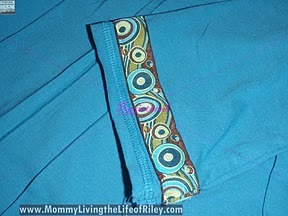 The ends are not finished in any way, nor are they tucked under and sewn into the seam like t-shirts are. Because of this, the ends around the sleeves, neckline and hem of the dress roll up in an irregular and unflattering way. Also, I believe that with frequent washings, this garment will start to ravel along these edges. I don't understand why such little care was taken with the ends of this garment. I really wish that the neckline, sleeves and hem of this dress were finished in the same manner that any other t-shirt is sewn. Next, if you look at the fourth picture on the left, you will see that the ribbon around the empire waist does not go all the way around the dress, even though the dress is created with a space for it. They only applied the ribbon around the front of the empire waist, which is unlike the ribbon around the bottom and sleeves of the dress. The rest of the ribbon on this dress goes all the way around the hem and sleeves of the dress and not just on the front, so to me, the empire waist ribbon located only on the front of the dress looks weird and doesn't match the rest of the dress. Finally, I don't like the large white Fashion Playtes label on the back of the dress. 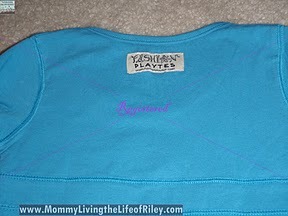 One of the options that you can buy is a custom label showing your child as the designer of this garment. This costs extra money of course, and if you don't care to buy the custom label, you are stuck with this one being displayed prominently on the back. I think that Fashion Playtes should also offer the option of no label at all, instead of insisting on their company being promoted on the back of your garment. Their label doesn't match this dress at all and to me, it sticks out like a sore thumb and doesn't look right. Fashion Playtes is a great concept with a multitude of cute designs and embellishments that any little girl would love to wear. If they would only change a few things, I would recommend them to anyone. Maybe I'm just being picky, but for the reasons I've listed above, I'm giving this product 3 out of 5 stars. If you don't agree with my critique of their clothing, then I would definitely recommend them to you because the overall experience of designing your own clothes is really a lot of fun! Disclosure: I received a $25 Gift Certificate from Fashion Playtes in order to facilitate my review. No other compensation was received. This product review is based on my own personal experiences with this item and is completely honest and objective. Wow, this is truly amazing. I unfortunately have forgotten the playmate I had while designing my clothes. It used to be this design plate which was accompanied by different templates which could be mixed and matched with anyone and the top most template would have the face of a model. There would be a black crayon which helped me to scribble the templates on to a piece of paper. But this is simply ingenious it truly brings dresses to life. What you create on the computer can be practically tailored and designed and also sold. Thank you for sharing this information, had I not known about this I would have been unable to allow my girls to design their own clothes. A suggestion to this software would be to bring out different cultures’ clothes and designs which can allow them to expand in global markets too. My daughter who is 5 wanted to design her own piece of clothing so we opted for the hoodie. 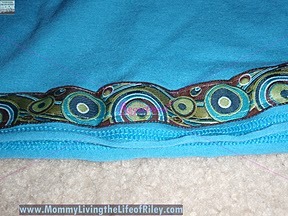 It was a base price of $20 and then once we added the embellishments and tag it was just over $40. Initially I was thrilled when it arrived, it seemed to be a well constructed sweatshirt and had great stretch and thickness. I was disappointed that the sequin ribbon was only applied to the front but the rick rack was applied all around so that was odd. What truly made me and my daughter really upset is that after washing this once the dye in the pink sweatshirt turned bluish in areas so now it looks like there are bluish purple stains on it. I’ve had this happen with cheap cotton items but its expected when you pay a couple dollars for a t-shirt at Walmart. I did not expect this to happen to a $40 sweatshirt. The most disappointing part is that my daughter was so proud of her design and she’s really sad the sweatshirt looks stained after only having worn it once! I wanted to let you know this in case you wash your dress and something similar happens. I know that it has nothing to do with my washer or detergent since I wash in cold water and don’t use any bleach or fabric softener. This is definitely a problem with the cheap dye used in the sweatshirt. I’m so sorry to hear that! Since the size I ordered was so much larger than what my daughter wears right now, I haven’t washed her dress yet. I’ve got my fingers crossed that it doesn’t do the same thing.